The aftershock of calamities goes beyond downpours, flood waters, and tremors. More than the immediate devastation, the aftermath of disasters are often more destructive, especially when it affects the cleanliness and safety of the displaced population . The Philippines is no stranger to natural calamities; in 2012, we registered the highest number of fatalities worldwide due to Typhoon Pablo . This year, aside from typhoons and monsoon floods, we also experienced earthquakes and manmade disasters, which exacerbated the lack of access to clean and safe food, water, and other emergency supplies. 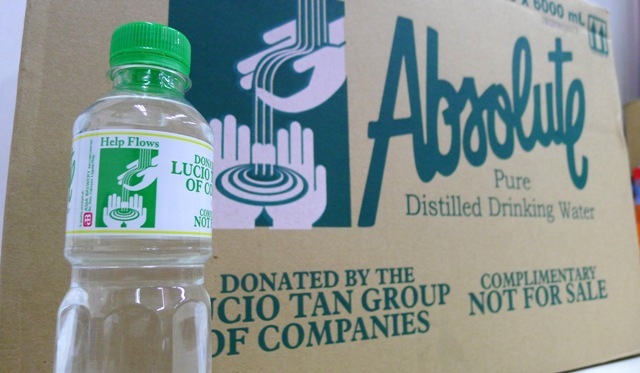 To supplement the various efforts of Filipinos to aid disaster-stricken areas, the Lucio Tan Group of Companies has donated almost 100,000 liters of Absolute Pure Distilled Drinking Water to calamity-stricken areas in North Luzon and Central Visayas affected by recent typhoons and earthquakes. The Absolute Help Flows bottles come in 350ml and 6L packs to ensure that families and individuals are provided with clean water for drinking and cooking. As a public service announcement, Absolute is requesting concerned citizens to report individuals or groups selling Absolute Pure Distilled Drinking Water with the “Help Flows” mark to their nearest DTI office. These bottles are allocated for disaster-stricken areas, and are not for sale. CHRIS & GEORGES LIFESTYLE MEDIA does not claim credit for any images featured unless otherwise noted. All visual content is copyright to its respectful owners. In no way are we responsible for, or have control over, the content of any external web site links. Information here may contain errors or inaccuracies; proprietors do not make warranty as to the correctness or reliability of the site's content. If you own rights to any of the images, or are depicted thereof, and do not wish them to appear here, please contact us for prompt removal.